Hello! Welcome to the Taylored Expressions June Spotlight Day! We released 8 new stamp sets, 5 new dies and a new cutting plate...They are all available in the TE store now! While Sabrina was creating her Tiny Chef cards, I crafted along with her and made this card using the new Graphic Greetings Get Well. 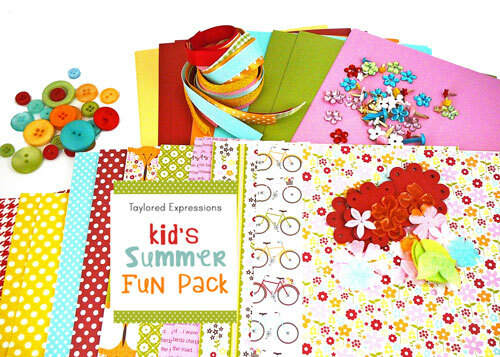 All supplies except for the hemp cord are included in the Kid's Summer Fun Crafty Pack. Accessories: Classic Rectangle Nestabilities – SM (Spellbinders), Ribbon, Button (Kids’ Summer Fun Crafty Pack), Hemp cord, Foam tape, Thread, Sewing machine. Your card is so cute and I love that you used the Kid's pack! 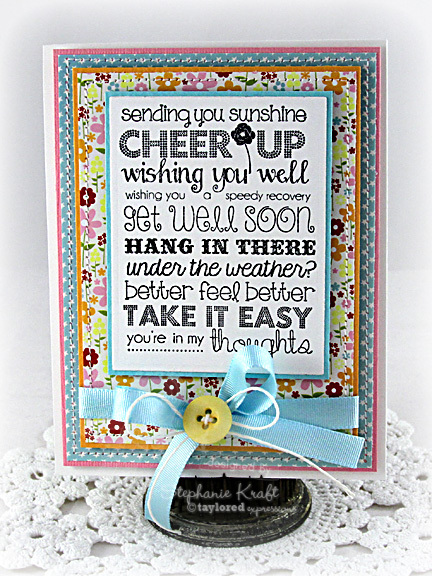 What a really fun card - like all the different sentiments and fonts. Cute card Stephanie! Love how you featured the sentiment front and center!